Iron and Manganese are commonly found in groundwater and well water throughout Co Limerick, Co Cork and Co Kerry. Next to limescale, the presence of iron is probably the most common water problem faced by home owners in Munster. Clothing washed in water containing excessive iron may become stained with a brownish colour. The taste of tea and coffee may also be affected by iron. Manganese produces a brownish colour in laundered clothing, also leaving black particles on fixtures and as with iron, affects the taste of beverages, including coffee and tea. At Liam Chawke Electrical, we use a unique filtration media which solves 5 typical problems of well water in one step and with one system. It effectively removes all forms of Iron and Manganese, most organic matter, softens the water as well as providing odour control. Our system uses a homogeneous mixture of five high quality natural and synthetic ion-exchange and adsorption materials with catalytic properties. The regeneration is performed by a salt solution and does not require a large flow and volume of water which distinguishes it from standard technologies. This unique ion exchange process removes iron, manganese and hardness (limescale). The minimum pH requirement is 6.0 and our system raises the pH in these acidic waters. The solution works best on clear water, i.e. when the iron/manganese are in a dissolved form and removes hardness with no extra treatment. The media bed can be sanitised with chlorine from time to time. The regeneration process is exactly the same as that used in a water softener and requires regeneration with salt. Our filter systems use special tanks with the advanced Vortech distributors. 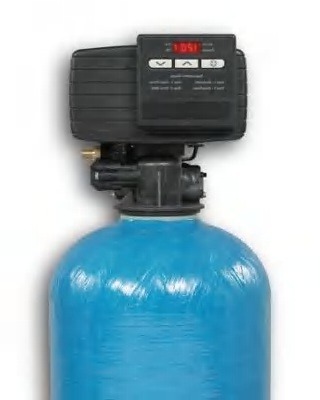 This allows the filter to backwash with up to 30% less water than standard distribution systems. The Vortech also requires 30% less backwash flow-rate than standard distribution systems. This is just one of the ways we provide our customers with innovative and cost saving methods of water treatment. Call us now at 069-64318 for more information or to book a free on-site consultation. To find out if your water contains Iron, Manganese or other metals, we recommend having it tested. Contact us for more details or submit the Water Test Request form.